I'm somewhat involved with PAD this year (Poem A Day through Writer's Digest), and by somewhat, I mean I have the first three prompts done, out of 14 posted. Yes, I'm bit behind. Nothing unusual. The catch up game is terribly familiar and I've learned to be pretty good at it. Anyway, the day 3 prompt is Triangle. Here it is, and the story behind it follows. Although originally meant to be song lyrics for a novel in progress, it took another turn last night and this morning after a minor panic attack yesterday. So, a double entendre here. It refers to a memory of a person, but also to a panic attack, using personification. The beauty of writing it out is that as I wrote, I realized why I work so hard at not being too easily excited. Excitement means extra adrenaline. Extra adrenaline tends to lead to panic attacks. It's not great poetry. It doesn't have to be. It's about the expression, the release, the self-exploration. I was accused of being fragile the other day. Obviously, this person does not know me. She made the assumption based only on a couple of my comments on social media. In my mind, I know I should blow that off entirely, based on the fact that she has no clue who I am or what I've been through. I know I am not fragile. I know I have been through things she couldn't imagine dealing with and still coming out mostly unscathed. I know I have learned plenty from all of those challenges and scares and sometimes soul-wrenching times. I know this. She does not. It's easy to call someone names somewhat anonymously, even easier when you know nothing about that person and they clearly do not matter you in the least. Easy. And so very wrong. The thing is: Sometimes I do feel very fragile. I feel fragile after events such as yesterday when so many innocent people are simply wiped out by hate. It's senseless. It's scary. It reminds us of our fleeting mortality. It makes us wonder how our loved ones would cope if it was us. It makes us, if we're human at all, so very sad for those lost who had so much left to do and for their loved ones who will hurt forever. I feel fragile when I get hit after hit while trying so hard to build my health up, or while trying to build my career up. I feel fragile when, after all of the strides I've made against my social phobia, I have a set back and want to hide in my house again. My last big set back was a year ago at a book event. That same event is coming up very soon and it's kicking those feelings right back in again. I don't want to go. I want to hide in my house or play in my garden and ignore the fact that half of my job is to market my own work. Yes, I feel fragile now and then. The thing is, while I might FEEL fragile at times, I am not fragile. Yesterday after dwelling on the event longer than I should have, I finally stepped away from my desk, away from the news, and dug into deep cleaning my house. I clean when I'm mad. I also clean when I'm upset. It's my way of bringing some control and order back into my world that feels too chaotic and unsettled than I want to deal with. I turned on my music, loud since no one else was here, absorbed myself in the beautiful music and lyrics, and made one of the places in my house organized, spit-shined, and pretty to look at. Today I will do more of that. I am fighting my third virus in four weeks and my energy is low, but last night I re-started my system cleansing and healthy habits. Taking control as much as I can, although I can't control the viruses my system can't fight off. Yesterday, I could not write. I was far too distracted and distressed, first by the nasty comments that were so fully unnecessary (not only am I and others who agreed with me fragile, apparently, but we are part of the problem by being military related and for refusing to allow victimhood), and then by the tragic, senseless murder of so many beautiful souls out enjoying music they love and having a nice time. I couldn't write yesterday. Today, I am writing, starting right here. It's not easy to write this. It won't be easy to go on about my business and work on a story. But I'm not fragile and this is what I do. I refuse to give in. I refuse to give up. Writing and music have pulled me through a heck of a lot over a lot of years, and they will again. Last night before bed, I even responded on that post again. I shared a music video: Hank Jr.'s "I'm For Love" with the line "if you don't like it, can't you just let it pass..." One of those who had been debating against my stance jumped in and liked the video and joked about it and you know what? That felt a whole letter better than leaving it as it was. Now, she wasn't the one making those comments. But I can now let that go and move along. 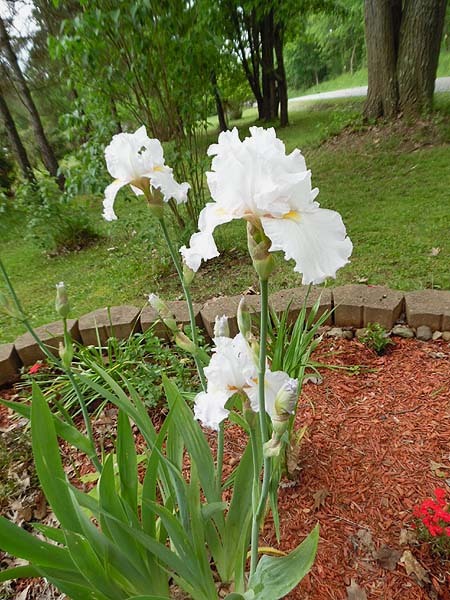 Back in May, I took photos of the beautiful white Iris I'd planted the fall before in my flag garden. 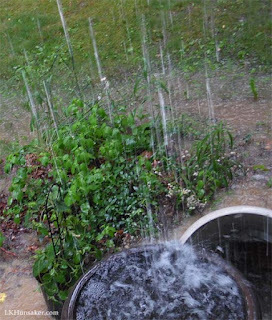 Later that day, it rained. Hard. It rained hard enough to flood part of the yard. 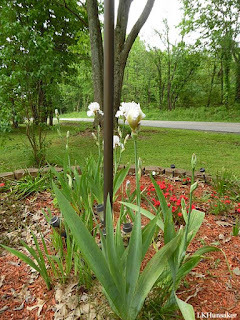 Yes, I was concerned about my white Iris in gorgeous full bloom. I didn't want them to fade before their time. I wanted to enjoy them as long as possible. Iris look terribly delicate and fragile. They're beautiful. They're artistic. They're soft and unassuming. Apparently, they are also terribly hardy against elements that try to destroy them. White stands for purity. That's why I specifically planted white Iris in my flag garden. Atop the pole that shows in the first photo flies the US flag and a POW flag. I am not fragile. I am not part of the problem. I am the strong, hardy-through-rough-elements wife of a retired soldier who has been through hell and back with him, and I am still standing, still climbing. I am part of the solution, or at least that's my goal. I am also an indie author with social phobia, bucking trends instead of going with the flow and staying true to myself rather than taking the easier route, and instead of hiding from that event that already has me on edge, I'll be there. Will it induce another set back? Possibly. But I'll be there. Yes, I have fragile moments. No, I am no more fragile than those white Iris I look forward to seeing next spring. Maybe I'll even add more this fall. By now, after sitting and writing this, I feel stronger already, ready to dust off the last few days and prepare for the next challenge. So... onward and upward... and here's a tune to take with you. The little one in this photo lives in the Mid-Atlantic. Her cousin, three months older than she is, lives in the West. Fortunately, visits back and forth have been often enough they do know each other well. 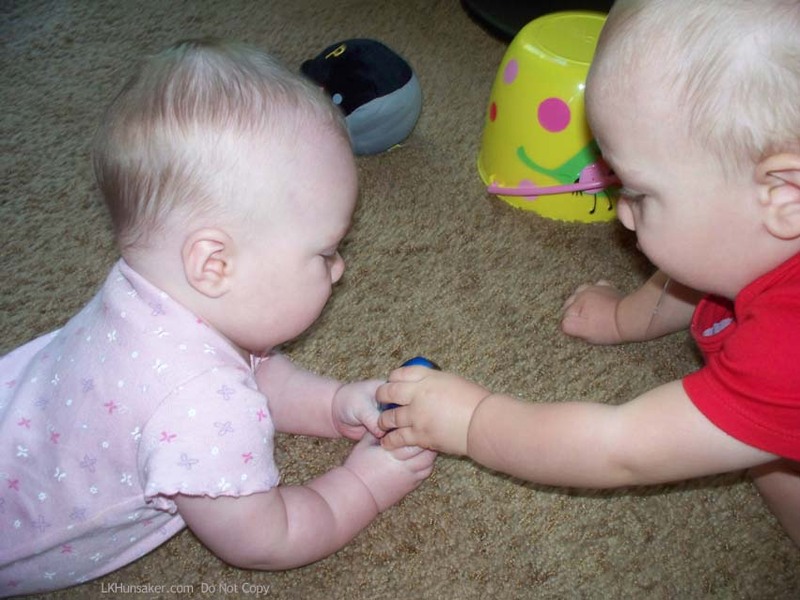 They met at six and nine months. Even then, Mr. J., the crawler, would get a toy for Ms. A. who was still barely creeping. He could see she had more trouble getting around and often helped her out with what she wanted. They ate in side-by-side chairs with trays and had no trouble sharing their food back and forth, both taking and offering and even feeding each other. 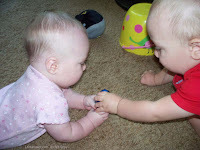 I've spent a lot of time with little ones, and that sharing thing is not at all typical of the age. Such a wonderful thing to see. They were best buds from the start. video chat. 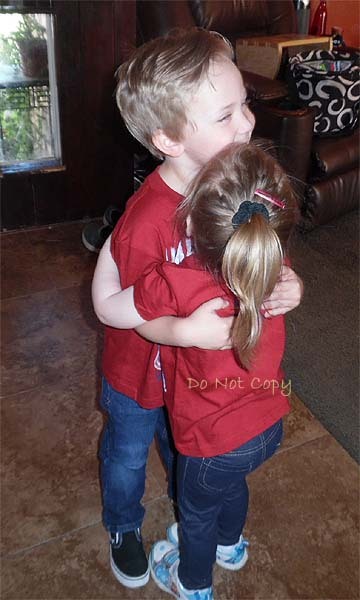 Oh, their little faces light up when they see their beloved cousin in real time! Still, separation is hard for us adults, so you can imagine how these two, who we nicknamed Thing 1 and Thing 2 after a very active cousin visit when they were always in trouble together, feel about not seeing each other often when they don't really understand why they can't or how much distance there is across the U.S. So yesterday when I had Ms. A. outside playing in the cool, pleasant Mid-Atlantic filtered sunshine, she decided to collect acorns. I suggested we could send some to J since he doesn't have that type of foliage out in the desert where he has to wait until evening to play outside. 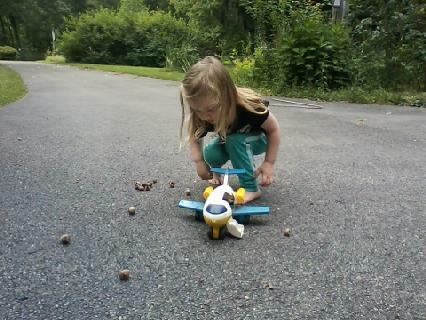 A promptly got a bucket from the sand box and picked up every acorn she saw and was then ready to give them to J. But, she wanted to give them to him in person. By her 3-yr-old logic, we could just go on an airplane and take them to him. Right then. A bit of pouting happened when I said we could not just go right now because it was too far, but we could put them in a box and mail them. Being the imaginative little thing she is, A did not leave it at that. She made a new plan. She took that bucket of acorns back to the porch to find her own airplane and stuffed as many of them as she could inside. I asked if she was sending them on a plane to J. She said, no, she wanted to give them to him herself, using her hands to show the act of handing them over. Then she walked a few steps away, acted like she was picking something up from the driveway, said she had "Little J" in her hand, and put him in the airplane, flew it a few steps, put it down, and opened the door. Then she was off running a short way, her arms wide open, and wrapped her cousin in her arms, pretending he was there with her so she could hand him the acorns. Yes, that could sound heartbreaking, but in a child's imaginative play, I found a good lesson. She made things the way she wanted them, if only for a moment. The smile was real. The hug was real. The emotions were real. To her, it was real. She remade the story the way it worked for her. No "can't" or "too far" in her story. She simply made it happen. This is the power of imagination, the power of writing your own story. If you can see it in your thoughts, you can make it real. Real is subjective anyway. Why not throw yourself whole-heartedly into what you want and make it happen, even if in your head momentarily? Even better, put it on paper. Write it the way you want it. For that time, it is real. Who knows what can happen when you start seeing what you want as reality instead of as a pipe dream, or dwelling on why you can't have it? Go ahead. Make it real. After all, we authors do it all the time and it doesn't hurt our actual lives; it enhances them. The human brain is plenty strong enough to accept created reality and still jump back to actuality as needed. Trust me on this. Writing about what you want can make a real, true, actual difference in your life. Many kids have some anxiety about starting the school year and about being in school overall. That's fairly normal, and generally that dissipates as the year progresses, usually fairly quickly. For those of you struggling through that right now, take a deep breath, hold your head up, and know it will pass. For a much smaller percentage, that anxiety goes well beyond the "norm" (norm can be hard to define) and the feeling doesn't pass. It's there all year. They must learn to handle it and continue going day after day after very long day until holiday breaks and summer vacation. They're anxious from the time they get up, with that anxiety increasing as they get ready to go, as they're on their way to school, when they get into the parking lot, and then it jumps into higher gear as they set foot in the door. Until the final bell rings and they can walk through the halls, out the doors, back to the parking lot, and finally breath a sigh of relief when they get to their own yard/house and can actually breathe again without wanting to scream from the ridiculous amount of tension they hide inside while trying their best to act as normal as possible, to speak when spoken to, to not physically explode when called on to talk in front of the class while they stammer and feel their faces turn red and feel the stares because they're stammering and their faces are red and the room is suddenly a sauna with a loud thudding drum beating through their brains, even when seated at their desk and need only a few word reply. Let me tell you: they may be walking out those halls on the way home, but inside they're doing a sprint that would put most Olympic athletes to shame. How do I know? I've been there. Every school year, all the way through two colleges. Every day. It's torture. If you're rolling your eyes at the "torture" bit, then you don't have Social Anxiety Disorder and can't truly understand it. Please, try to understand. We are not simply shy. We are not simply nervous during public speaking (most people are). We are nervous when a friend speaks to us, even when a family member speaks to us, because we know they're expecting us to answer in some way and the thought of having to talk to someone, of saying something that we'll worry about how it sounded for days afterward is enough to freeze our otherwise very lucid thoughts and feel like complete morons, which we know is actually untrue, but many times, we're not sure it's untrue. We're often thought of as much less intelligent than we are simply because we lack the ability to speak calmly and rationally out loud. We know there's something very wrong with us. There is. Saying otherwise is a slap in the face. No one should have to feel that way every day of their life, day in and day out, other than when they're alone, and even then, they can be anxious when thinking over what they might have said and done during the day. We turn down invitations to things we would really love to do because we can't stand the thought of being around all of those people, even if they're people we know. We have trouble going grocery shopping because ... there are People there! Not because we're tired of putting up with some of the ridiculous or rude stuff some people do, but just because they are people. We can't even go sit around a campfire with a bunch of people we've know for years and relax and have fun. There is no such thing as relaxing if others are around. It doesn't happen. That's not just regular social anxiety, which most people have to some extent. That's Social Anxiety Disorder, which used to be called Social Phobia, a term I still use. We all have traits of usually several disorders. There's nothing unusual about that. It becomes an actual disorder when it severely interferes with your life, such as someone with agoraphobia refusing to ever step out their door, or someone with mysophobia refusing to ever touch anything or anyone without sanitizing himself afterward. 1- We are not being snobs. We are afraid to talk to you. It's really that simple, and that complicated. 2- We are not stupid. You can't imagine the stuff going on inside our heads. 3- If we walk past you while out and about and don't respond when you wave or try to speak to us, chances are very good that we did not see or hear you because we're intensely focused on not being overwhelmed by having so many people around us, and we have to block them out to survive the ordeal. Don't be insulted. It'll make things harder on us if we know we unintentionally insulted you. 4- We can't stand it when someone mentions how quiet or shy we are. Trust me, we know. Mentioning it only makes it worse and makes us want to dig faster through that hole in the floor we already want to crawl into. Please don't. 5- Teachers: Please, PLEASE understand what social phobia is and how much we're already struggling. Look it up. There are tons of posts on Pinterest that explain what we're feeling, and we'll never be able to tell you. Please, don't call on us unnecessarily. And above all, never make jokes about how quiet we are or how we have trouble making ourselves answer you. True story: In college, I took a mandatory class called Senior Seminar. It was half graded on class participation. I could not get my degree without it. The professor, I was happy to find out, was a psychologist. As such, I expected he would understand when, during the mandatory "meet privately with the teacher" session, he explained that my written work was outstanding but my grade was suffering due to lack of participation. So, I told this college professor, a trained psychologist, about my social phobia and that I was trying very, very hard to make myself participate verbally and thought I was doing fairly well considering how hard it was. He told me I needed to try harder if I wanted a decent grade. I was literally shaking as I left his office: the meeting was so disturbing and uncomfortable and he was so condescending. And then he called me out in front of the class the rest of the year to push me to talk more, which had the opposite effect. Result: a C in the class and a strengthening of the phobia due to being pushed and from, what I felt, was betrayal from someone in the field of my major I was supposed to be able to respect. Teachers: Please, do not be this guy! 1- Don't mention it unless you know her very well, and then ask how you can help. Never push. 2- Don't laugh at verbal mistakes or stammering. 3- Accept that she may want to just listen and include her in a conversation without pushing her to talk. 4- Invite her to low anxiety activities such as a movie or a walk around the park. That can expand to few-people activities later. 5- Realize although it may be uncomfortable for you, it's for worse for her and she's doing her best to not make you uncomfortable. Relax and accept the quiet. 1- Please know you're NOT ALONE. There are about 15 million of us in the United States, and that number is probably higher since we generally don't want to talk about it or admit it. 2- It is NOT a life sentence. At least it does not have to be. It may never fully go away, but there are things you can do to lesson the anxiety and live a more normal life. Yes, you can. 3- WRITE about it. Do it. Keep the journal or notebook where no one will find it and write about how you feel and how you'd like to feel, about bad days and good days and about your goals. On days you can't write about it but need release (what day don't you need release? ), draw it out instead. Scribble. Doodle. Color. Whatever. Get it out. Or work with clay. 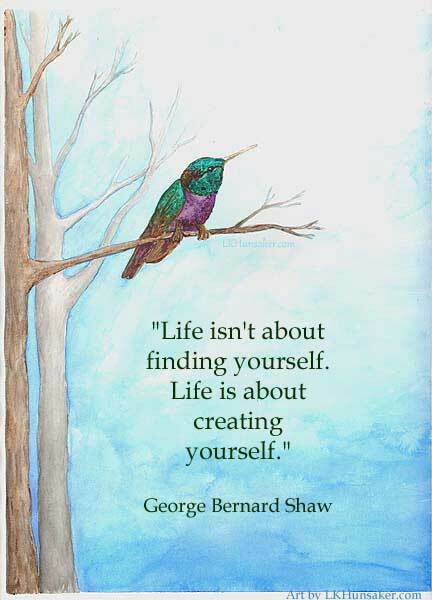 Create what you're feeling. You can always smash it, if you'd like. 4- Hang in there. Things will get better. Please, share this with anyone you think might need a hand in recovery or who is dealing with someone close to them who is social phobic. I know it's not always easy for them, either. It took a lot of years for my husband to understand my SAD and to learn how to help instead of making it worse because they don't understand. These days, I seldom want to crawl into a hole just because I'm talking to someone. I do book signings with few nervous issues and without an all day migraine the next day due to the extreme stress it used to be. I go to events with my husband's friends and am able to talk to them like a real person. I'm even running a local book festival. It's taken a LOT of years and a lot of back and forth struggle to get this far, but if you want it enough, you can do it. Stay tuned. And take a deep breath. I've often heard writers say their books are like their children, usually when asked to choose a favorite which is often impossible. I always rebelled against that saying. Children are children. Nothing is like a child and nothing can stand up to comparison of beautiful little children in all of their innocent glory. Don't get me wrong: my books are part of me, also, as my children are, and I get that. It's still not the same. But I've finally come to understand why writers can say such a thing. Two months ago, my computer crashed. Yes, I have most of my stuff pretty well backed up, and luckily I was able to do a restore and it pulled back all of my writing (and photos, files). What it didn't save was my OneNote contents. I love OneNote. It's the best writing tool I've found other than pencil and keyboard. I do not love that the contents are NOT saved during a restore. In my OneNote, I had a folder for every book and within those folders I have outlines, research, notes, and even bits of dialogue I want to pull in at a later point in the story. Writers know that once you write those bits of dialogue, if you lose them, they're likely just gone. Vanished. I had a TON of them for my Rehearsal series, which is the closest book to being able to compare to a child I have -- I've been working on it since long before I ever thought about having children. It's a niche series, very long, very detailed, sometimes intense, and only a handful of readers will bother with it. I know this, but that doesn't matter. It's the story I most need to write for myself and my characters are truly a part of me. They are. My last OneNote backup onto a jump drive was in 2013. Losing every bit of research and notes, and especially that precious dialogue was devastating. It was devastating to the point I nearly stopped writing altogether. I just couldn't face it. It came to me yesterday that I was in mourning. My energy is gone. My impetus for jumping up in the morning to get to work is gone, other than my family, which yes, does matter more. My passion for writing is gone. I'm still doing short stories, on paper with pencil, for my own challenge of a story a week, although I'm far behind on it. But it feels like routine, a must-do, more than a passion. Trust me, I tried everything to get those notes back. I even went to an expert. He couldn't do it, either. For the past two months, I had a glimmering hope that there was one more way I could do it, but I couldn't make myself try because I wanted at least that glimmer of hope. Two days ago I made myself try. It didn't work. I've now and then tried to help console authors who lost chapters or such of their books by saying the next draft of it will be better and stronger, so I'm trying to take my own advice and believe what's really lost I didn't really need because something better will come. Sigh. I hope that's true. I have lost chapters before. I know that's tough. But this... losing dialogue and story pieces that help define characters and story, especially in a complex series that will end up around a million and a half words, is truly like losing part of someone you love. At least it is to me. I suppose that means the passion is still down within somewhere just smoldering and waiting through this necessary mourning period. As the photo above shows, the sun does rise again. You just have to let yourself see it. 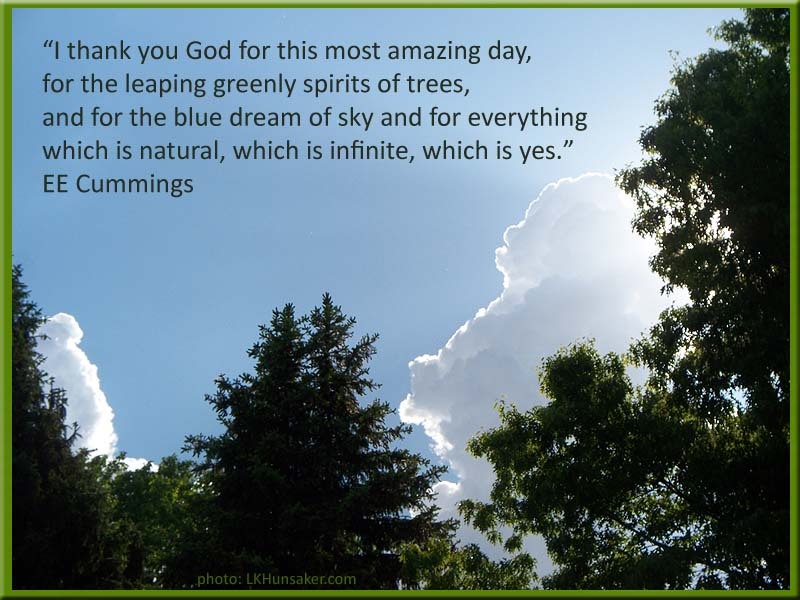 LK asks the question: How did (does) writing save me? The question brought up so many memories, it's difficult to pin down just one. I will give it a go, however. As a young teenager, writing meant little to me. I wrote only during school assignments such as essays, or the occasional letter to a family member. When I was in junior high, I had to write an essay about a famous person (I don't remember who). Uncertain how well I did, I asked my mom to read it. Her response, “This was very well written.” I could tell by her expression that she was actually impressed, an emotion she didn't show often (her standards for her two daughters were quite high; but she also knew we were capable of it. Thanks, Mom). I reread my essay with more objective eyes and had to agree. Fast forward a year or two. I hated my teenage years. For one, I was far from popular, often teased and called names. One friend even went so far to tell another friend that she didn't want to hang around me anymore because, “I would keep her from being popular.” Add to that the normal confusion that comes with being a teen – neither child nor adult, wanting more responsibility, but not, aching to be an individual yet pressured to be like everyone else, and all the physical changes that goes with it. Communicating with speech was never my strong suit. Still isn't, which is why I avoid confrontation at almost all costs. I like to say God didn't attach my mouth to my brain properly. The thoughts in my head never come out of my mouth the same way, and as such I am often misunderstood. Frustrating to say the least. Lonely at worst, because no one knew or understood what I was going through. Not their fault; I simply had no means of expressing it well enough. Heck, I myself didn't know what I was going through. My thoughts and emotions were so jumbled and intense that I coudn't make sense of any of it. I don't know what started it, but I began writing a journal when I was about 13 or 14. What I found after reading what I wrote, it all made sense! Especially during those highly emotion-charged moments when I couldn't give voice to why I wanted to scream, lash out or cry. Once I saw it on paper, however, I understood the why. And in understanding the why, I could push through all that icky angst, and better, know I was going to survive. How's that for an epiphany? I still have the journals I filled up from the age of about 15-17. They're simple spiral notebooks that barely held together by the time I was done with them. I also have a notebook filled with miscellaneous sheets of paper, some torn from other sheets of tiny poems, thoughts or story ideas. No matter where I was, even during a concert at church with no lighting, I would put pen to paper and let my hands fly. Oddly enough, some of my best poems came from writing in the dark when I had no idea what I was writing at the time. I often miss those days. Now as an adult with a full-time job and taking care of my family, finding time to sit and write has become more of a challenge. I don't keep a spiral notepad on hand, but I do have my iPad mini with a ZAGG keyboard. I've been caught by my boss several times furiously writing a thought on said iPad. I know. My bad. Part of the reason writing can be torture as the quotes above say is because writers pore out everything they are into them. That includes the good and the bad, the ugly and the beautiful. Scary stuff. But as the quote by Maya said above, keeping it in is worse than letting it out. Writing can be hell, but it can also be our salvation, often at the same time. It has for me. All I can say at the end is thank you, God, for the gift of language. It has saved me in more ways, and more times than I can count. Andra Marquardt works as a Land Surveyor in North Dakota, is happily married and has a young son. She writes Christian science fiction and likes to throw her opinions around on her blog at www.almarquardt.com/blog. They are asked to paint the cancer. Most reach for the ochre, the black, the red, and their paper becomes hideous, jagged, ferocious, infernal, howling, and torched. An enemy drawn in its vilest forms. The tall woman does none of this; she proceeds to paint a beautiful garden, a bright sun, a lady sleeping on the cool patch of grass. The tall woman, is always quiet and composed; as a painter this manner intensifies. Her flower blooms are gifted with bees and butterflies. The following week they add narrative to the paintings. Most are stories of the grotesque, some stay in the darkness, some stories move to the light. The tall woman went last, after a stretched sigh, she holds up her painting of the wonderful summer scene. She points to the small area in gray, in the stone path, there hidden, a shadowed face, its cloak, and its sliver-like sickle. She reads, “Once upon a fine day it emerged from its silent tomb to slay the woman.” The horror in the room is palpable, this tall woman is 32 years without cancer, if she’s still hostage when will they ever feel free? He declines the magnetic poetry board. Many do. Composing a “poem” is unnecessary stress in a room of the necessary. Forty-five minutes into the first hour he wanders around the art corner like a caged panther. He briefly picks up the mallet and taps a few notes on the Chakra chimes. The next day, about an hour after he returned from lunch he asks about the paper cranes hanging in a mobile made from wire clothes hangers. He expresses an interest— in seeing it done. And watches the slow careful creases become a bird of flight. Then silently nods and returns to his usual bench to stare out the window in concentration, as if folding it all over and over again in his mind. Weeks later, at four and a half hours into confinement he picks up an errant magnetic board that someone placed in front of him when leaving the waiting room. He flicks at the words in the determined way of working an abacus. Then he begins to move the words pushing left to right, up and down, like a slide across puzzle. When he scrambles for the car in his routine gallant way of whisking his wife away, we see the intimacy of the words he left behind. Some random. Some in margins. Some grouped naturally in a haiku-ish formation— one clearly intact. These stories are from my experience as a volunteer with an art therapy initiative at an oncology center. When people are going through illness or any stressful time, creating art, or more specifically journaling, is a very powerful tool to help cope. It can open a portal for reflection, growth, and healing by forcing us to think more clearly, giving a sense of purpose, being visual proof of having accomplished something, survived. Just seeing your thoughts and feelings written down somehow validates them, even if you are the only one seeing them. Don’t judge what you write, just write. After my own cancer diagnosis, I often wrote as a way to expel the darkness and anxiety I naturally carried about my prognosis. Sometimes it was the only ventilation for my most distressing emotions. A journal is a place where the writer does not have to put up a brave face. Its primary purpose, like any art therapy, is catharsis. 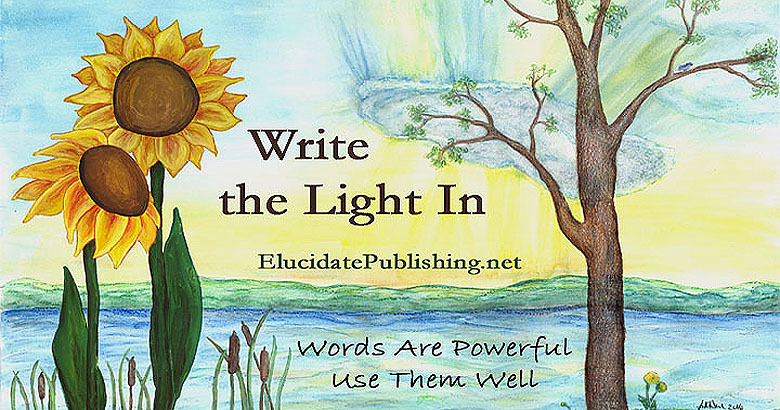 Elucidate Publishing is the home of Write The Light In, a quest to spread the idea of self-healing through the written word. We share links to relevant articles as well as original articles and essays. We also do occasional indie book reviews. 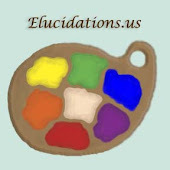 For our sister site, click below on the Elucidations: Indie Arts logo. For writing nudges or daily inspiration, a Pinterest board: Follow LK Hunsaker's board Write The Light In on Pinterest. All original material on this site © Elucidate Publishing. Featured material © its authors/artists.. Ethereal theme. Theme images by tjasam. Powered by Blogger.